Most arachnids aren't considered maternal creatures, but the rule has exceptions. For instance, the various species of female wolf spiders carry their young in a distinctive manner both before and after they hatch. Scorpion mothers also carry their young on their backs for a period after birth. Large and hairy, wolf spiders are members of the Lycosidae family. All of the hundreds of wolf spider species sport eight legs and eight eyes -- four large and four small. Wolf spider shades include black, brown, tan, gray and striped markings on the body. Wolf spiders might mature up to 1 inch in length, males smaller than females. Most wolf spiders are nocturnal, hunting for insects and smaller spiders. 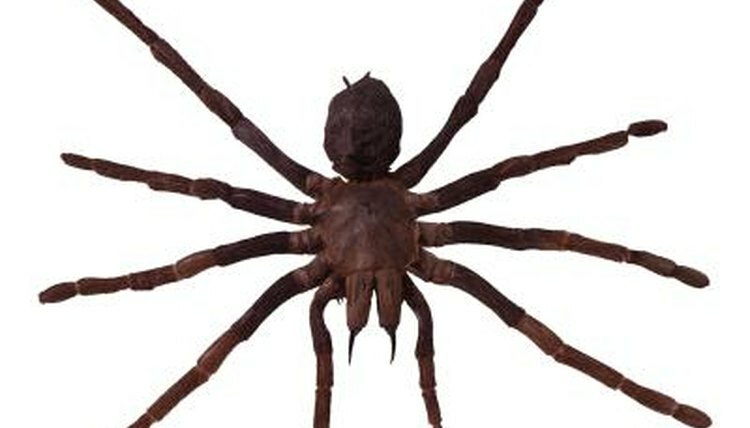 They're called wolf spiders because they actively hunt rather than spin webs to ensnare their prey as other spiders do. To reproduce, a male wolf spider creates a silken ball and deposits sperm in it. The female spider inseminates herself through these balls. Before laying eggs, she weaves a large, silk mat. After laying 100 eggs or more onto the mat, she takes up the silk and weaves it around her eggs. After that, she brings the mat sides up, creating her own silk ball. That ball might be the same size as the spider. She then attaches this elaborate egg sac to her silk-weaving organs, the spinnerets, located under her abdomen. Until the eggs hatch, this ball accompanies her everywhere. Incubation occurs during daylight hours, when she moves her silk ball toward the sun. The female wolf spider tears open the silken ball when her eggs are ready to hatch. After hatching, the spiderlings head to their mother's abdomen, but the sheer number means that many end up on her back and legs. She might be covered layers deep with baby spiders. A female wolf spider shows concern for her young, at least compared with other spider species. Should the female spider lose her silken ball, she'll search constantly until she finds it. While she protects her spiderlings from predation, they don't consume the prey she catches. Her offspring stay on her for two to four weeks, depending on the species. If any of them fall off beforehand, she makes no attempt to retrieve them. By the end of the carrying period, they begin leaving their mother of their volition, able to fend for themselves. While the wolf spider is singular among spiders in carrying her young, most of the world's 1,200 scorpion species do it, too. After a gestation period ranging from five months to nearly a year, a female scorpion gives birth to live young, who emerge from her body in clear sacs. After escaping from their birth sacs, they climb onto her body. They stay on her back for about two weeks, going through an initial molt, before heading off on their own.